A camera and a projector take the image from the oscilloscope and puts it on the screen of the scene. The author starts with a series of improvisation in the synthesizer and this comes reflected on the screen in the instant. Later on, other elements enter like the rhythm and AudioGeometrical figures from which we obtain a new musical language. 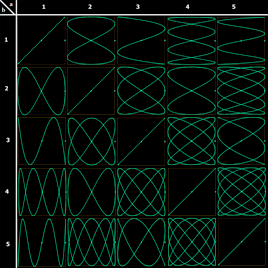 Jules Antoine Lissajous (1822 – 1880), French Physicist who from 1855 developed diagrams Lissajous as a means to demonstrate visually the vibrations that produce sound waves. 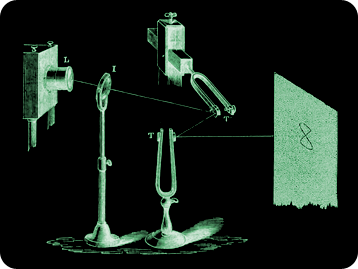 Lissajous first reflected a ray of light in a mirror attached to a tuning fork that vibrated and next another mirror in another also vibrant tuning fork. The projected beam was creating a figure, which depended on the amplitude and frequencies of the vibrations and their relationship .